The Spokane Police Department K-9 Unit is partnering with Paw Print Genetics to improve the genetic health of dogs in the SPD K-9 Unit. Paw Print Genetics, a canine genetic health testing company offers screening for genetically inherited diseases in dogs. Genetic testing is performed through a simple mouth swab. 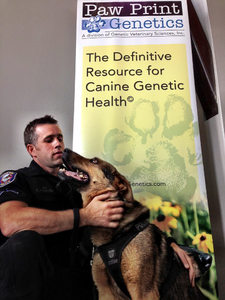 Services performed for the Spokane Police K-9 Unit will be donated by Paw Print Genetics. "Our tests should be used prior to breeding the dogs or training a new puppy" said CEO, Dr. Lisa Shaffer. "Training a dog for police work is costly. By screening for genetic disease, we can reassure the City that these dogs can perform their work and live more productive lives." The Spokane Police Department utilizes seven canines in the K-9 Patrol Unit and provides support to SPD members and other regional law enforcement agencies by safely and efficiently searching buildings and vehicles, apprehending suspects, tracking fleeing suspects, and protecting police officers. The canines also provide support by finding evidence, searching for lost subjects that are in extreme danger, and teaching other law enforcement agencies basic and advanced K-9 skills and tactics. Although none of the SPD K-9s have shown signs of inherited genetic conditions, Paw Print Genetics will conduct genetic testing to provide a base-line for future health of the dogs and the SPD K-9 breeding program. Paw Print Genetics' service is unique in the industry in that they offer a Canine Genetic Health Certificate© that shows which diseases the dog has been screened for and their results. This certificate can be stored for future reference when deciding which dogs should be trained or bred. For German Shepherds, a breed commonly used in law enforcement and military K9 units, Paw Print Genetics offers testing for six inherited genetic diseases.